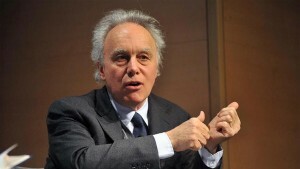 Francesco Giavazzi (Bergamo, 1949) obtained his PhD in Economics at MIT in 1972. Currently he is a macroeconomics professor at Bocconi University and known for his research in economic policy (fiscal and monetary policies) and famous for his book Macroeconomics A European Perspective (with Alessia Amighini and Olivier Blanchard), very used in introductory macroeconomic courses in Bachelor's economic programmes. He combined his position as a professor with other prestigious jobs like the Treasury Ministry, the Bank of England, the IMF or the Federal Reserve Bank of New York. Nowadays he combines his academic position with his membership in research centers like IGIER (Milan), CEPR (London) and NBER (Cambridge, US) and also he is the president of the CEPII (Paris).